The Soo Greyhounds are on to the second round for a sixth straight year, defeating the Owen Sound Attack by a score of 7-4 on home ice in Game 5. The Attack went down fighting in this one, recovering from a 3-1 deficit to knot the score before Sault Ste. Marie’s Tye Kartye (2) scored the third period game winner. Keeghan Howdeshell (4, 5) scored a pair of goals while Jaromir Pytlik (3), Alex Johnston (3), Ryan Roth (1) and Cole MacKay (1) added singles. Jaden Peca recorded three assists for the second time in the series while Barrett Hayton added a pair of helpers. Los Angeles Kings prospect Aidan Dudas (2, 3) scored a pair of goals for the Attack, being joined by Zach Poirier (2) and Daylon Groulx (1) on the scoresheet. The Hounds outshot the Attack 31-24, recovering with four straight wins following a Game 1 overtime loss. The Attack see their season draw to a close, finishing with a 31-31-4-2 record for sixth in the conference. They were led in scoring by Dudas who finished the year with 62 points (26-36–62) over 68 games. Hayton led the Hounds in series scoring, posting 10 points (4-6–10) over five games. They advance to face the Saginaw Spirit in second round play. The Niagara IceDogs turned in a dominant 4-0 victory, advancing to the second round of the OHL Playoffs with a 4-1 series triumph over the North Bay Battalion. It was Dogs from start to finish as they outshot the Troops 57-27, going 3-for-5 on the power play. 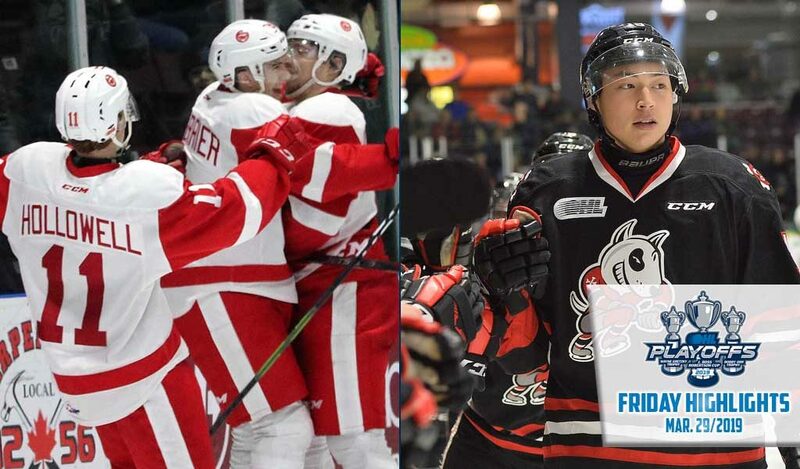 OHL scoring champion Jason Robertson (2) struck on the power play 3:52 into the first period before Akil Thomas (2), Jacob Paquette (1) and Jack Studnicka (4) followed suit. The win came before a capacity crowd of 5,300 and was aired across the country on Sportsnet 360. Stephen Dhillon turned aside 27 shots to post his third shutout of the series, becoming the first OHL goaltender to do so since JP Anderson of the 2011 Mississauga St. Michael’s Majors. North Bay’s Christian Propp made 53 saves in the loss, turning in a .929 save percentage on the series as the Troops saw their season come to an end. The Battalion played to a 30-33-3-2 record for seventh in the conference. They were led in scoring by overage captain Justin Brazeau who scored a franchise record 61 goals. The IceDogs await their second round playoff opponent. They were led in series scoring by Boston Bruins prospect Jack Studnicka (4-4–8).